Out at the park in the middle the night, not a single living soul as far as the eye could tell was in sight. Not even whiff of spiritual energy or a human or a low class hollow. The occasional rustle of a leaf against the tree, or maybe even the crooning night call of a nearby owl, though not one witness the ripple made out of thin air as the fabric separating the living world and the dead was torn open to reveal a black portal like structure that camouflaged with the darkness of the area. The silhouette of a woman in victorian summer dress could be seen silently dropping from the open "gateway" as it closed back behind. She lifted the folds of her skirt a little as she landed on the field of grass, pausing to slide her slender fingers through the soft, form fitting fabric to smooth out the wrinkles as she looked around . Leaving not a single square inch of the scenery untouched as she drank in the very detail of the place with soft greedy eyes. It had truly been too long since her last visit to the realm of the living. She had nearly forgotten how beautiful everything would look. As a sudden breeze picked up and tousled her loosely curled hair about, she gave a soft gasp from the goosebumps that appeared along her forearms before retrieving a small hair ornament from her pocket in order to fasten back her in a make shift ponytail. The wave of the grass that rippled in response like stabilized ocean water fascinated her. That, along with the trees that stood behind her rustling in a soft hiss. She exhaled. The smallest of actions made the place so lively, unlike Hueco Mundo who had the liveliness of a spoon in comparison. The seemingly endless acres of sand for the most part stayed perfectly still depending on the circumstance . The trees here were alive, not glum and glassy like the quartz branches, but lush and tall. And the residence that inhabited earth..
Well, both species were rather corrupt. The italian woman thought with a bemused smirk. Except the hollows that wandered the menos forest had the unfortunate drawback of being both ugly, AND stupid rather than just being stupid. Though as the clouds passed over the moon to let its light bathe the area in a soft silver glow, Anastasia was once again lost at thought as she raised her head to take in both the real light of the moon, and the stars that freckled across the sky along with it. Hueco Mundo had a moon too, though it was never deemed much as beautiful to the girl, instead she found it rather eerie, artifical, and dreadfully lonely. She took a seat on the grass, her spiritual essence lowering down to nothing as she admired the fullness of the moon with a look of content and a gleam of wonder. Even if it was abstracted by the clouds every once in a while, it was still just as magnificent. Something that she had planned awhile ago now to capture down for a new art project the first chance she got. She had thought she had done a considerable job on sneaking her way out hueco mundo without disturbing anyone back at home. And even if her abscence was noticed, the raven haired female assumed that her comrades wouldn't pay too much mind and dismissed any possibility of them coming all the way here to retrieve her. 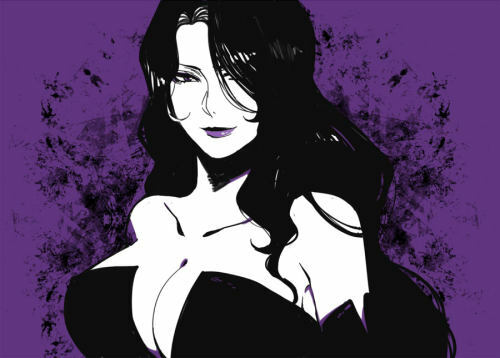 Quickly, she retrieved a sheet of paper from the confinements of her dress along with a small tube of ink she had bottled from the previous hollow that had challenged her, and a small paint brush she had found in the remainments before reconstructing Hueco Mundo. Dampening the bristles of the brush with the tip of her tongue before uncorking the bottle of ink and dipping it. Adjusting her seating position so that her legs were tucked beneath her body so that she may use her lap as a support for her thin make-shift canvas. And with few delicate strokes across the page, she began to slowly capture the image of the scene before her. Only pausing to look back up at her reference before her hand continued to quiver across the page, with her thoughts warmed about the idea of how she would fabricate this for her final piece. "You will look as they say,stunning." She whispered. Ellade's sword sunk into the metal of the practice doll. Well, it was a practice doll, now it was just a pile of scrap metal. She sighed and yanked the thing from it's post, she tossed it into the pile with the other beat-up poles, that had been her last one. Ellade's mind was stormy earlier so she set out to clear it with the swing of her blade. She liked to use metal dolls since she couldn't bring herself to bother anyone to practice as much as she wanted to, she didn't really get anything from 'fighting' the dolls, but it helped to keep her sane. She decided that she would go bathe, she hadn't worked up a sweat, but she was an orderly woman and she had the mind to keep herself looking orderly as well. A half hour later, Ellade was walking through the halls of Las Noches, they were quiet and she wanted to find company. As the humans said, there's more than one way to skin a cat, keeping company quieted her mind as well. She found herself wandering the the Primera's room, she found Anastasia to be a good person to sit and chat with. She knocked on the door, she waited in silence for a few moments before she knocked again. Her eye twitched in annoyance at the fact that she was being ignored, she tried to sense the dark haired woman's spirit, but she found the room to be empty. Ellade frowned, she was disappointed in the woman's absence, not that she'd let on that she was so. She would have to find something else to do, she did not care to go out into the desert or into the forest of menos. She stood in the hall for a long moment before she decided that she would visit the human's world, she had not visited the living world for a while and she decided that she would easily be able to find entertainment there. Her heels clacked down the hallway as she walked to her room, she decided that she would go to Karakura town. 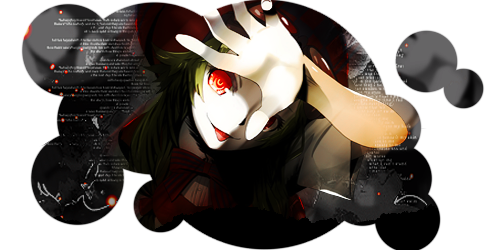 There were a greater amount of shinigami there, although she would not start anything, it would be nice to take a whack at something a bit stronger than a metal doll. She opened a portal, the dark blue night sky of the human's world met her eyes. She stepped through and the fabric of the universe wove it's self back together, she landed on the pavement of the street, the metallic heels of her shoes clacked. She turned her head in the presence of a familiar energy that wilted, she turned on her heel and headed towards the general direction of the wave as it withered away. She came upon a park not too much later, she couldn't say she was surprised to find the Primera working away at a piece of canvas. Ellade was glad to have found her original conversation target, she felt as though she were in luck. She hadn't bothered to hide her spiritual pressure, so she was sure that she had been noticed by now, but it was rude not to announce your presence. Upon sensing the spiritual energy of the fifth espada, her head perked up slightly. Though she said nothing up until she heard the fellow arrancar's voice which casually greeted her. Her lips twitching up into a small smile as she paused what she was doing, and tilted her head back to look up at the Asian woman who towered over her with warm violet red eyes. As usual, Ellade had chosen to dress in her signature blue robes beneath thin metal armor that glinting as it reflected off the touch of moonlight, her usually glossy hair was darker than usual pooled downward on her shoulders in a slight wavy manner as it did when itwas damp, and judging from the fresh scent of soap that radiated from the woman, Anastasia could tell she had showered. Thus had finished her training session early for the evening. "Ellade, my friend, do not tell me you have come all of this way just to find me." She chuckled, waving a a hand over the empty space, gesturing for the woman to take a seat beside her as she worked. Out of all the others, two arrancar had bonded quickly within a couple of weeks of knowing each other, as they were similar in certain characteristics yet entirely different in others, fastening their respect for each other with a sense of understanding. Causing the Italian arrancar to become quite fond of the noble woman which was made apparent while the two were together. "I had no intention to cause an inconvenience of any sort, though I am pleased to say that I have found the perfect focus for my next tapestry. Perhaps a design that I will weave into a new set of armor for you, if you would like." She painted in the main focus of the scene before angling the paper in a certain way so that it would fall under significantly better lighting; Which it did. Contrasting against the stark white surface, the swift smooth strokes of the brush left behind a well made image painted from the black ink which colored it. Despite her limited resources, the Primera had managed to smudge the ink to create a lighter shade to blend different values into the mix. The darker shades going into the sky while the lighter values were embedded in the black background in the form of countless stars that surrounded the full moon, completed with a soft silhouette of the trees in the bottom half corners below. Though it wasn't the most impressive feat she had accomplished, a sparkle of excitement reflected off the smooth surface of her irises which matched the glow of pride that emitted across the shorter woman's features in the form of both a wide smile that dimpled her cheeks and crinkled the corners of her almond shapes eyes. Setting the work back down on her lap, she went back to touching up the picture from any possible flaw that would offend it. Brushing away the slightly curled bangs that fell across her face and in turn invaded her vision, which was quickly solved as she tucked the stubborn strand back behind her right ear. For a moment it was silent. Though it wasn't unpleasant one, mind you, it was simply for the purpose of finishing up her personal assignment before once again making eye contact. After all, it was rude to not make eye contact while talking to someone. "I trust that training had gone well, no?" Ellade sat when she saw Anastasia motion for her to do so, she didn't plan on bothering the woman if she wanted to work in silence. It was rude to invite yourself. She gave Anastasia enough space to continue working, but sat close enough as to not be impersonal. While she was not the analytic sort, Ellade had lived long enough to get the basics of social interactions down to a science. She folded her hands in her lap and returned the woman's look with a smile when she mentioned weaving her a new armor. "You're so thoughtful", Ellade said warmly. She didn't favor taking things from people, but the armor Anastasia made her was always durable and light. She had become so used to wearing the plates spun by the woman's thread that she thought any other type of armor was too clunky and heavy. "I will continue to wear this set until it wears out", she said, her conservative side showing. She detested wasting things, especially things that were created for her. She showed her appreciation for the gesture by wearing the armor until it was pierced. When the silence fell over them, Ellade looked down at her folded hands to give herself something to keep her mind occupied. She dug her sharp nails into the soft flesh of her skin to keep her mind from wandering. Although she was tense, it was nothing more than she usually was when left to her own devices, so it didn't seem like she was uncomfortable. Ellade looked up when she was addressed, thankful for the interruption. "Yes, Although I have finished too early for my tastes", Ellade responded. She usually took more time when she was training, perhaps she did need to start bothering others to practice with her. "Please", Ellade said, motioning towards Anastasia's painting. "You do not have to stop on my account", she didn't want to be a hindrance to the woman's works. Kaede dashed across the roofs. Her short green hair fell over her head like a messy mop. She wore the boring shinigami outfit with the addition of her vice captain's badge around her left arm and the blue flats on her feet. Her blue eyes, which were perfectly clear of all other colours, shone brilliantly in the sunlight. She and her captain had arrived in the world of the living earlier that day. "Spiritual pressure can be so damned loud," She grumbled to herself. Her cheerful mood would have lasted if she had not been introduced to the powerful reiatsu that was on display that day. But she couldn't actually hear the reiatsu, no that would be a gift in itself. She did refer to feeling reiatsu as hearing. It was a unique way of speaking. She gave a loud sigh and jumped down onto the ground, "I was really hoping for a simple mission. This is not simple."